Just make it Toyota...if it looks like this concept, has a powerful (and tunable motor - perhaps a turbo option) it'll do wonders for your image, and will be a profitable product. I hope they release it soon b/c it'll do wonders. That hood is probably my favorite feature of the car. I'm also starting to love the unique headlights. 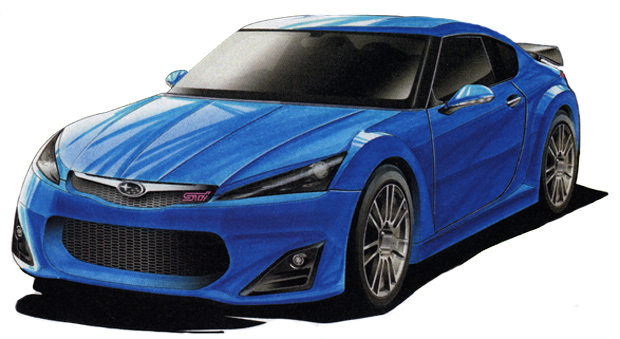 Toyota and Subaru confirmed as far back as April of last year that the two companies would collaborate on the development of a new affordable sports car and earlier this month we saw the first tangible evidence of the partnership with the unveiling of the 2009 Toyota FT-86 Concept. We now have images of actual prototypes caught while testing at Germany’s Nurburgring. These are still test-mules so the final shape and design will look very different to this but we can still gather a few discernable details. The new car will be sold by both Toyota and Subaru, although several reports claim the Toyota version will be exclusive to the Japanese market while the Subaru model will be a global version. However, while Toyota’s version is scheduled to go on sale in Japan late next year or in early 2011, the Subaru version is yet to receive the production green light. As for the actual development, Toyota is reportedly responsible for the styling of the car while Subaru is handling most of the engineering. This means the new model will be Subaru at heart, with a four-cylinder boxer engine in both naturally aspirated and turbocharged forms planned. Base models will be strictly rear-wheel drive and have a power output of around 220-horsepower. Though no official details have been released, it’s expected that an all-wheel drive flagship with 300-horsepower from a turbocharged flat-four will be available as well. A six-speed manual transmission will be standard, although an automatic is also expected to be available. The projected pricing for both cars will start around $25,000. I'd love that, too, of course, but it's far from certain. One new rumor states that the upgrade will be enlarging the 2-liter 200 hp direct-injected naturally aspirated boxer engine to 2.5-liters and 250 hp. 2.5L I4 with twin turbos churning out ~250 hp and around the same torque would be just perfect. Fingers crossed! If the estimated weight of under 3k lbs is true, I'd be happy with 250hp NA. I don't really need more than that to have tons of fun. Awd and 300hp sounds like a massive price increase and a curb weight jump.... that isn't what I'm looking for. I was hopeing for the current WRX's engine, with the rear tires remaining the driven axle. The genesis coupe had most what I want, but failed when it turned out to be way overweight. As long as Toyota/Subie don't allow the same mistake, this thing should jump off dealer lots. Why would Toyota sell their version only in Japan??? flat 6 swaps. let it begin. That black prototype looks to have fog lights and maybe headlights that are similar to a Impreza, and overall looks more subi than like the red Toyota concept shown. Perhapse this one is the Subi version?